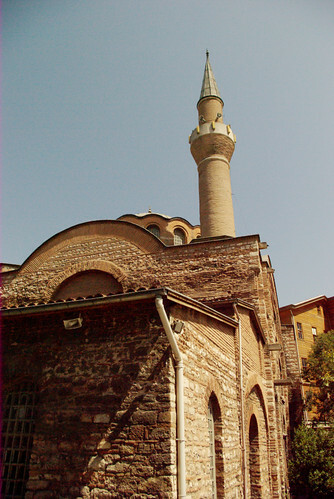 Kalenderhane Mosque is a church converted into a mosque by the Ottomans. It is located near the Girls’ Dormitory in Vezneciler on 16th March Martyrs Street in the Vezneciler District of Eminönü county. It isn’t exactly known when the church was built, but it is assumed to have been built between the 9th and 12th centuries. Because of neighboor buildings, it was difficult to frame correct. I’ve used Pentax K10D. Kalenderhane Mosque (Turkish: Kalenderhane Camii) is a former Eastern Orthodox church in Istanbul, converted into a mosque by the Ottomans. With high probability the church was originally dedicated to the Theotokos Kyriotissa. This building represents one among the few still extant examples of a Byzantine church with domed Greek cross plan. It is located in Vefa, Fatih.